The Wiener Staatsoper’s season closed last night, and I finally got to see the new production of Janáček’s Kat’a Kabanová, conducted by music director Franz Welser-Möst and directed by André Engel. First: There is a myth that the Wiener Philharmoniker is the pit orchestra at the Staatsoper under a different name, but this is almost never true. Usually at the Staatsoper you hear a mix of aspiring Philhamoniker members, dead-end would-be Philharmoniker members, and subs. How else could they play at the Staatsoper and Musikverein simultaneously? Last night, however, it actually was genuine Philharmoniker. And they had rehearsed, and hoo boy, could you tell the difference. I haven’t heard anything like this coming out of the pit all season. The cast was a bit overshadowed, and the less said about the production, the better. But I’m going to say it. It’s not any good. Janáček, Kat’a Kabanová (Kátja Kabanová). Wiener Staatopser, 6/30/2011. New production directed by André Engel with sets by Nicky Rieti and costumes by Chantal de La Coste [sic?]. Conducted by Franz Welser-Möst with Janice Watson (Kat’a), Deborah Polaski (Kabanicha), Klaus Florian Vogt (Boris), Marian Talaba (Tichon), Norbert Erst (Kudrjás), Stephanie Houtzeel (Varvara), Wolfgang Bankl (Dikoj). Kat’a Kabanová is an adaptation of Ostrovsky’s play The Storm, and originally takes place in an isolated Russian village. 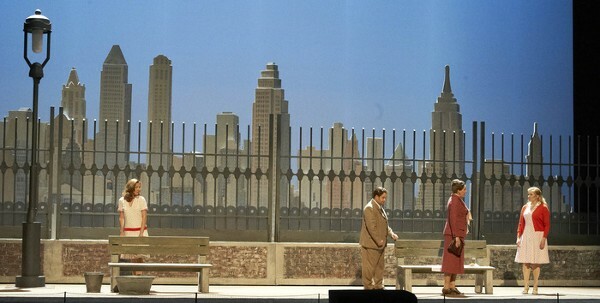 Engel’s production is set in what he calls “Little Odessa” in NYC, among Russian immigrants in around 1950. You may know this neighborhood as Brighton Beach. Why is he calling it by a more obscure name? Unfortunately the whole production suggests that it is because he didn’t think this through very well. The libretto harps on the restrictions of Kat’a’s claustrophobic country life contrasted with the vague promise of the distant world of Moscow. This doesn’t mean a city setting couldn’t work; Christoph Marthaler’s Salzburg production, set in a grim Communist apartment block, is wonderful. But the immigrant experience is the exact opposite from Kat’a. Kat’a is about provinciality and isolation, while life as an immigrant is about being in the middle of a foreign world and confronting the unknown. Like her cousin Katherina Ismailova of Lady Macbeth of Mtsensk (also partially based on The Storm), Kat’a is suffocating, and shine of Manhattan’s skyline does not fit with that. The set produces a large number of clean, eerily empty and dead city scenes. Seriously, if this is New York, where are the people? The score does not require the chorus to be onstage and no supernumeraries appear, resulting in desolation and an exceptionally underpopulated storm shelter in Act III. The visuals look oddly low-rent and incomplete, short on individual detail but not in a stylized way, and the whole thing lacks atmosphere and poetry. A major reason for this is the blocking, which is functional but poor, with no attention to the gestures of the music or the small details of characterization that make this kind of drama come alive. Some vaguely lesbian Varvara-Kat’a stuff seems inserted solely for The Male Gaze, and there is a spanking scene between Kabanicha and Dikoj that really should not have happened. I thought the production’s worst moment was its last, in which Kabanicha kicks Kat’a’s dead body. We know she’s evil, and to end the performance with such a cartoonish gesture, as the music practically cries for Kat’a, is just horrible. 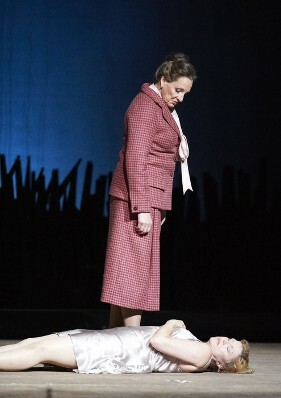 The opera is not about Kabanicha’s cruelty, and to end with her is all wrong. However, the real stars of this performance were in the pit. It’s been a rough season for music director Franz Welser-Möst, getting off to a good start with Tannhäuser and Cardillac but satisfying no one with disastrous productions of Don Giovanni and Figaro and missing most of the Ring due to illness. But after repeatedly proclaiming his love for Janáček, he backed it up with a layered, lyrical performance that was still exciting. I’ve rarely heard such fine playing from the pit here, from every section. Despite my antipathy to the Philharmoniker on political grounds, when they put in some effort they can be super. This was a very orchestral performance that frequently overpowered the singers, but it sounded damn good. In the title role, Janice Watson was OK but didn’t make a very strong impression. She seemed to know exactly what the music should sound like, but her voice wasn’t always backing her up. Her tone was sometimes threadbare, other times coming nicely into focus, but her top notes stayed squally throughout the “flying” scene. She was more on the dreamy and fragile than the hysteric side of things, but I lost the inner glow and yearning that Kat’a needs to transmit. Deborah Polaski was excellently cast as Kabanicha and has all the power you could wish for, but the production let her down in the acting department. Despite her ability to cast scornful looks, between the kvetching and the spanking and the corpse-kicking, it was not exactly coherent. Klaus Florian Vogt is a really special singer, but didn’t have more than a few moments of real memorability as Boris. He’s not the type who can do a lot with a smallish role (Boris doesn’t get a big scene as such), he needs a moment where that weird and wonderful voice can shine. That voice–a light, transparent Mozart tenor gone Wagnerian in size–does seem to be a good fit for Czech repertoire, and he had more success against the orchestra than the rest of the cast. But he’s not a stage animal, and tended to be overshadowed, though I’m not entirely sure by what. Norbert Ernst gets my vote for most reliably solid male Staatsoper ensemble member, and was a good Kudrjás, though what he was doing with that microscope and test tube at the opening escapes me. That’s another way of saying that fellow ensemble member Marian Talaba is not one of my favorites, and while he seems stylistically at home in this music his voice is always gargly and strained. At least his less-than-dashing stage figure was actually appropriate as hopeless husband Tichon. Stephanie Houzeel, who has also had an uneven season as an ensemble member, sounded OK this time around as Varvara, and knowing Vienna her legs will probably make the season retrospective picture book. 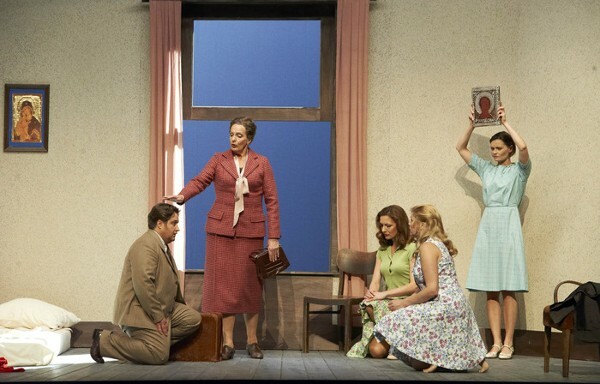 This seems like an ideal production for the Staatsoper to end on, because it demonstrated quite well what the house can do and what it can’t when it comes to new productions. The orchestra can pull out a truly remarkable performance once in a while. And the chorus is great, though they didn’t do much in this opera. But casting, while illustrious, can be not quite right (to be fair, they suffered from a late cancellation in the title role of this production), and is sometimes weighed down by iffy ensemble members who mysteriously stick around for years. And nearly every new production is a theatrical mess, no matter how traditional or untraditional you like your opera. Hopefully Dominique Meyer will be able to improve things in coming years. That’s it for Wien, folks! On to the festivals!